I have the opportunity to purchase a Saffire SG-18 that was used once, still looks brand new inside, wondering if anyone has any info on it? Looking at the Saffire site, looks like this model isn't made anymore and I couldn't find much info on it. Good kamado? It comes with the stainless cart and cover, what would a fair price for a used (once) one be in everyone opinion? Guessing from the name that is an 18" kamado like the KJ Classic size, I am guessing a lot of the accessories that fit other 18" brands/models would work ok for it? I would be looking for a deflector, pizza stone, maybe a divide and conquer type setup and probably a few different grate setups. There are some folks with Saffires on our forum. I would check the Saffire forum section and pm one or more of the guys who cook on them with your questions. Horses mouth, so to speak. I have no personal experience with Saffire, but from what I have seen on this site, they make a really nice kamado. Congratulations on the purchase. I was looking at the Saffire grills also before buying the Kamado Joe. 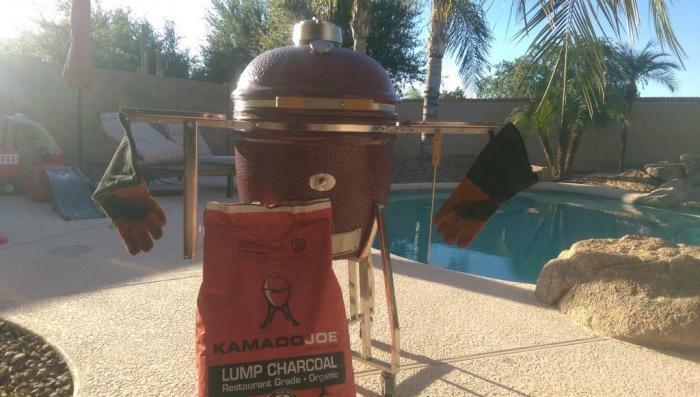 I ended up choosing the Kamado Joe because of the great deal I got on it at the Costco roadshow. You are going to love that grill! Post pics of your cook! Nice score. Please show it off. Lotsa pix please. If I were going to buy another Kamado i would look very hard at the Saffire. The more i look arounf their web site the better they look. They look top quality all the way. I used to get them confused with another make but once I figured it out --i am really impressed. Didn't have time to take many pics but as the seller I bought from had said, it was used just one time and from the inside, it appeared that was true...will post more pics when I can and from the first cook this weekend Vision is staying in the box for now, if this works, I think there won't be a need for the Vision. It came with a pizza stone, plate setter/deflector, ash tool, smoke chip feeder, 2nd tier rack, Saffire gloves and cover. I bought the KJ lump from local Ace and a BBG Dragon to help get temps up quicker for fast/high cooks. Nice looking grill there. You are going to get some great use out of that thing. The things you mentioned above will not present a problem. You could always keep both grills! Or take the vision back and get a junior sized grill!! I love having the Joe Jr. especially for those smaller cooks for just the wife and me. Nice grill, awesome pool area!